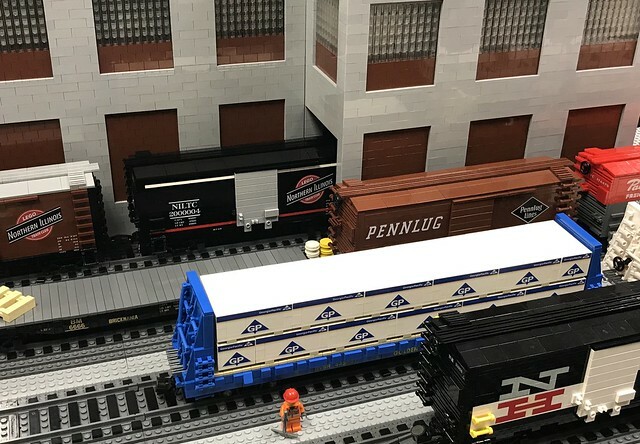 I keep seeing all these great boxcar builds on Flickr, Eurobricks, and Facebook and I think how great it would be to have a few on my LUG's layout. So, I'm proposing a LUG boxcar swap. The idea is to create a boxcar for your LUG and have extras to trade with other LUGs at shows and conventions. Way back in the day, there was something similar called the container swap. LUGs (or members) designed a unique container that fit on the LEGO TTX cars and they had extras to swap with others. This project is a little bit larger in scale than the containers, but pretty much the same principle. You design your boxcars and have the decals created for your LUG. A few places I can suggest for decals are either OKBrickWorks or Maci's Monograms; both make quality decals and are willing to work with their customers. If you decide that you only want to swap decals, that's fine as well, as long as both parties agree. The main idea here is to create some diversity on our layouts and to foster a feeling of community. My suggested choice of boxcar is the BMR Pullman Standard PS-1 40' boxcar. It fits into any time frame and is fairly simple to add lots of customization. I've already started this with PENNLUG as you can see in the picture below. I have one almost ready for LUG PERU and am working on a car for CINCY LUG as well. Hopefully I'll have these ready in about a week for Nebraska Brick Days. Suggestions, thoughts, ideas, comments...interest...feel free to add! I'm still waiting to see if we (Brick Central LUG) are participating. I might prod the ambassador. Please, PROD!!! Would love to get some UK items on the layout! Hoping to swap a car or two at NBD next weekend so I'll be sure to update flickr/facebook/eurobricks with a pic or two of where the swap is at. Something fun I've been doing for all of the people who get the decals from me (OKBrickWorks) is give every boxcar a unique number. Would be neat to see a bunch of them in a row at an event like BrickWorld. Sounds like an excellent idea! Most model train clubs I know of do something similar, and I have a few of the club specific box cars that are around the area sitting in my HO collection. Yep, and it better be sand blue too! I thought the OKB car was dark red, and the CincyLUG was sand blue?